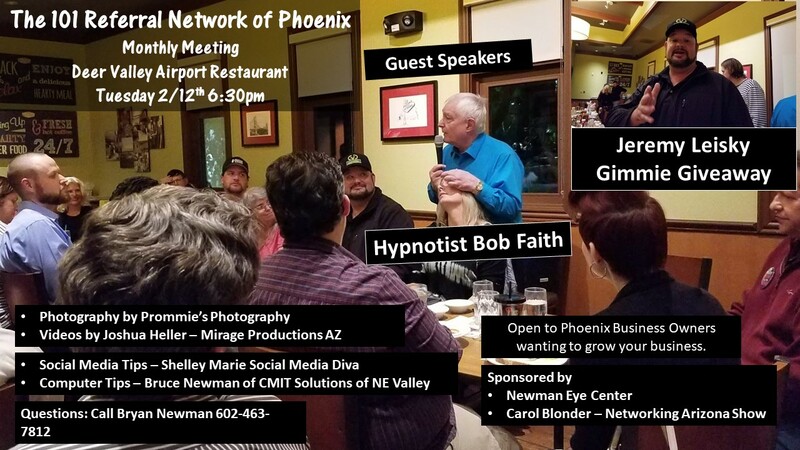 Present your business at our 101 Referral Network of Phoenix Meeting Tuesday February 12th at Deer Valley Airport Restaurant from 6:30pm-8:30pm..
Hypnotist Bob Faith of Bob Faith Entertainment. Videos will be taken by Joshua Heller of MirageProductionsAZ. We’ve been meeting since 2011 and have connected hundreds of business Owners over the years! Guests are always welcome to grow your business with our group! INVITE A FRIEND TO ATTEND! Plan on eating something from the menu so that we can maintain our good standing with Deer Valley Airport Restaurant.